As you start into your brewing life, you learn that the trub on the bottom is a pain in the bottom (wow, he said that? ), because it clogs your spout or bottling wand and gets in your beer. People who have been brewing for a while tell you that you can prop up the LBK with a CD case. You may say "what's a CD case"? If you try it, you will find that they crack, and slide around. And when you have an overflow they get all gooky (technical beer term). My solution was to build custom ramps (I use the word "custom" to hide the fact that I cannot cut a straight line with a straight edge). Work great, they stop the LBK from sliding sideways, or back, and hold it in the perfect position to fill bottles. I should patent it, but Mr. Beer is likely to get rid of them someday because of their new 8LX fermenters, so I guess I won't. I inherited / stole a fermentation freezer this summer, and the ramps work great - on two shelves. On the other shelf they are too tall, and the shelves cannot be adjusted. This summer, before I stole the freezer, I brewed at my in-law's and the neighbor brewed his first batches with me, and shared the space. He was remolding his kitchen and had spare tiles, so he used those to prop up the LBKs. Fancy, expensive tile. This week I started using my newly acquired Target LBKs, and have 4 going. I put the LBKs on DVD cases and cracked several. 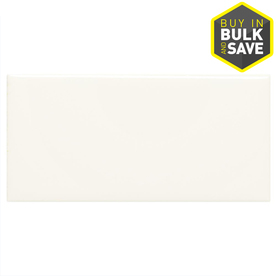 Today I stopped at Lowe's and bought white subway tiles, 3" x 6", for $.22 each. All set. 4 for $.88 plus tax. I prop mine up with a couple cases, not while brewing, but at bottling after cold crashing and it keeps the bottles pretty "clean". I like the idea. But I put my LBK in it's bottling position (ie kitchen counter), and I let it sit there for a few hours to let the disturbed trub settle out. Additionally, I do the opposite of your ramp! When beer line in the LBK gets too low flow nicely out, I actually prob the BACK end up (very carefully to not disturb the trub) so that I can get more beer out and into the bottles. If you cold crash, you don't want it sitting out for a few hours. Regardless, if you prop it up when it's fermenting, and then you don't prop it up when it's sitting on your counter for hours, you are flowing the trub back towards the spigot. Yes, when you're almost empty, you need to prop up the back of the LBK to get every last drop. A door jamb would be very narrow, the LBK could fall off either side. A book would work but if the LBK overflows and you have it in a tub or on a cookie sheet you'd ruin the book. Note the reference to gooky when I used CD cases. I don't cold crash. And I have never had any problems with trub in my LBKs. The danger with trub does come into play when you prop up the back to "get every last drop." But when I do it an hour or 2 before I bottle, that trub has settled and therefore no issues. I supposed if I had more free-floating stuff in my keg like unbagged hops or loose fruit bits, I would really need to cold crash. I use whatever I have laying around. Two times ago it was the ring from a mason jar I had laying out from canning. Since the lid was put away last batch, I used a roll of electrical tape that didnt make its way back to the workbench. Yup, I am a creature of laziness. In reference to the LBK, are people propping up the front end near the spiggot, so the trub flows to the "back" of the LBK? Or propping up the back, so the trub settles below the spigot? I have yet to brew my first batch, so I am having trouble picturing where and how the trub will gather. Ah... yes.. but I stand my LBK on one of those small wooden boxes that clementines are sold in (keeps the spigot well off the table) and it is fairly easy to balance the box on a door jam.. When my Mr. B refills arrive, I tear one (or more) of the flaps off the cardboard box packaging. I proceed to fold said flaps over "x" times to the desired thickness, and slide under the front of my LBK to achieve the desired tilt. I recycle the balance of the cardboard packaging, and happily pocket the $0.88 I could've spent at Lowes on subway tiles. They are tilting it back away from the spiggot. I am mostly making lagers so I have to move my LBK to and from my cooler so it's pointless for me to prop it when I'm just going to disturb it when I move to bottle. I cut two, one for each LBK, 1" srtips of 1/4" plywood that I had leftover after my recent 6-pack Lunchbox project. They don't crack like the CD cases and are wide enough that my LBKs are stable. Was basically free since I would have thrown out the scrap bits anyway. I did nearly the same thing. I was using the CD cases at first but when I was putting up a cedar picket fence I saw a golden opportunity for the extra pieces I had to cut off when I got to a hill. Works like a charm. I'll say one thing, we sure got a lot of improvising individuals in this hobby. I am just lazy. I really do not have a big trub problem as I use mainly only extracts not grain, and it settles well into the LBK trough. Any that transfers to bottles settles firmly to the bottom after a few weeks. I flush the first 1/8 cup or so until the spigot is trub-free, then bottle until close to end then I just tilt carefully towards spigot, watching through the open top so I stop before I get significant trub in bottle. I always consider the last bottle as an early taste experiment anyway so I am not too concerned if a bit of yeast gets in there. Besides, it will carbonate faster. I guess with all grain and loose hops you have a bunch more stuff floating around to be worried about. Only filter I could think of would be a gold-catching sluice. Some sort of plastic miner's moss. yea its a tricky task, I use just about anything to tilt it, but I deal with it sliding so I took an old printing blanket I use on a diamond envelope press I operate, the back side is an adhesive material, with a rubber matte finish on the other side. I basically wrap the cut size blanket around a block of wood that's cut at an angle with the rubber side holding the block in place and preventing the lbk from sliding. Sorry if I missed a post on the same question. Should you also prop the 8Lx? I noticed trubal collected around the spigot so a few bottles have that now. The spigot on the 8Lx is much higher than on the LBK so propping may not be necessary. But you can prop it up if you feel the sediment is too loose/thick. Would you suggest that I prop up my LBK with 6 days of fermenting already going on or is this a process that should be done at the beginning to not disturb the process? You can do it now. Many people will prop it up during cold crashing only. Others will prop it up during the whole fermentation. As long as it has time to resettle, propping it up now should be fine. OK, I will prop it up when I get home today just to make sure not to get any trub in my beer and get the most out of my LBK when I bottle it. Thanks!